James Michael "Jim" Peterik (born November 11, 1950 in Berwyn, Illinois) is an American musician and songwriter. He is best known as a member of the band Survivor and as vocalist and songwriter of the hit song "Vehicle" by The Ides of March. 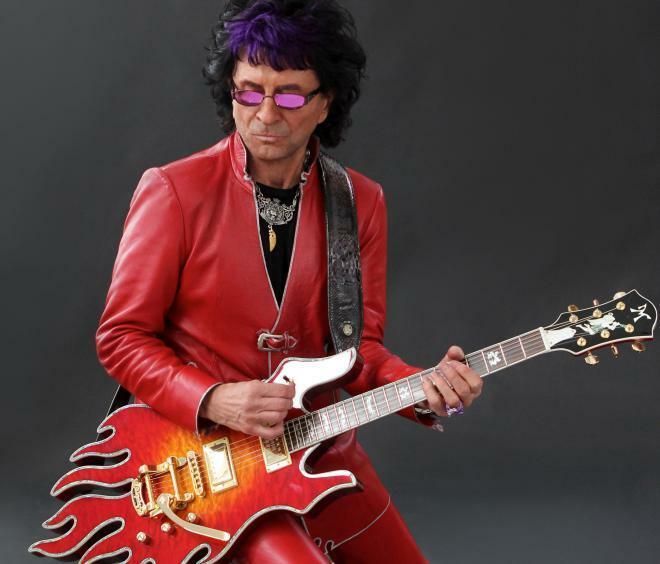 He also co-wrote the anthem "Eye of the Tiger," the theme from the motion picture Rocky III.Peterik has co-written songs for the likes of 38 Special, Lynyrd Skynyrd, Blackhawk, Cheap Trick, Sammy Hagar, Cathy Richardson, Van Zant, Brian Wilson, REO Speedwagon and The Beach Boys. He is currently fronting melodic rock band Pride of Lions, smooth-jazz project Jim Peterik's Lifeforce, and has a regular series of yearly concert performances with an all-star cast as World Stage. Jim is also active as a producer and mentor to young, developing talent. 1 Two songs from each of his famous bands, The Ides of March and Survivor, appear in a Sylvester Stallone film: Survivor's "Eye of the Tiger" in Rocky III (1982) and the Ides of March's "Vehicle" in Lock Up (1989). Both songs were important in motivating Stallone's character to "beat the odds". Great American Rock Anthems: Turn It Up to 11 2013 TV Movie documentary writer: "Eye of the Tiger"
Grand Theft Auto V 2013 Video Game writer: "Burning Heart"
Turbo 2013 writer: "Eye of the Tiger / Holler If Ya Hear Me"
Broken Hearts 2010 writer: "Vehicle"
Whip It 2009 writer: "Caught Up in You"
The Goods: Live Hard, Sell Hard 2009 writer: "Caught Up in You" - as James Peterik / writer: "Vehicle", "Aire of a Good Feeling", "Bald Medusa"
Spectacular! 2009 TV Movie writer: "Eye of the Tiger"
100 Greatest Hard Rock Songs 2008 TV Movie writer: "Eye of the Tiger"
Karaoke Revolution Presents: American Idol Encore 2 2008 Video Game writer: "Eye Of The Tiger"
Guitar Hero World Tour 2008 Video Game writer: "Eye of the Tiger"
SingStar '80s 2007 Video Game writer: "Eye of the Tiger"
The Hammer 2007 producer: "Eye of the Tiger" / writer: "Eye of the Tiger"
The King of Kong: A Fistful of Quarters 2007 Documentary writer: "Eye of the Tiger"
The Texas Chainsaw Massacre: The Beginning 2006 writer: "Vehicle"
Astérix et les Vikings 2006 writer: "Eye of the Tiger"
I Love the 80's 3-D 2005 TV Series documentary writer: "Hold On Loosely"
Rebound 2005 writer: "Eye of the Tiger"
Kicking & Screaming 2005 writer: "EYE OF THE TIGER"
Jane Doe: Til Death Do Us Part 2005 TV Movie writer: "Fairy Tale Love"
Robots 2005 writer: "EYE OF THE TIGER"
Without a Paddle 2004 "Hold on Loosely"
Barbershop 2: Back in Business 2004 producer: "Your Precious Love"
Dumb and Dumberer: When Harry Met Lloyd 2003 writer: "Eye Of The Tiger"
The Master of Disguise 2002 writer: "Eye Of The Tiger"
Big Fat Liar 2002 writer: "Eye of the Tiger"
Run Ronnie Run 2002 writer: "Caught Up in You"
How Chicago Rocked the 60's 2001 TV Movie documentary writer: "L.A. Goodbye"
Dr. Dolittle 2 2001 writer: "Eye of the Tiger"
Joe Dirt 2001 writer: "Hold on Loosely"
The Animal 2001 writer: "Eye of the Tiger"
38 Special: Live at Sturgis 1999 Video documentary writer: "Rockin' Into The Night", "Wild Eyed Southern Boys", "Fade To Blue", "Rebel to Rebel", "Deja Voodoo", "Fantasy Girl", "Chain Lightening", "Caught Up In You", "Hold On Loosely"
Das Gelbe vom Ei 1999 TV Movie producer: "Eye of the Tiger" / writer: "Eye of the Tiger"
Doctor Dolittle 1998 writer: "Eye of the Tiger"
Ivory Tower 1998 writer: "Hold on Loosely"
An American Love 1994 TV Movie music: "The Sound of Your Voice"
Lock Up 1989 writer: "VEHICLE", "EVER SINCE THE WORLD BEGAN"
Desperate for Love 1989 TV Movie writer: "Hold on Loosely"
Eye of the Tiger 1986 writer: "Eye of the Tiger"
Rocky IV 1985 producer: "Eye Of The Tiger", "Burning Heart" / writer: "Eye Of The Tiger", "Burning Heart"
The 55th Annual Academy Awards 1983 TV Special writer: "Eye of the Tiger"
Rocky III 1982 producer: "Eye of the Tiger" / writer: "Eye of the Tiger"
Survivor: Eye of the Tiger 1982 Video short writer: "Eye of the Tiger"
Heavy Metal 1981 writer: "Heavy Metal"
While We're Young 2014 writer: "EYE OF THE TIGER"
The 68th Annual Tony Awards 2014 TV Special writer: "Eye of the Tiger"